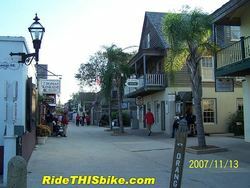 The historic village in St. Augustine, FL. I recently passed through St. Augustine, Florida, a town I'd visited on my honeymoon five years ago. It's a town of beaches, historic buildings, alligator farms, and ghosts - Indian, Spanish, French, and English - from the state's tangled path through colonialism, civil war, and statehood. The town was named for the 4th-century saint who believed the body was a drag on the purity of the soul. Strolling on the sunny boardwalk, I pondered the previous intense weeks, and the workout my body had experienced from singing and touring harder than ever with Brother Sun. Getting the body in tune to sing begins with the previous night's sleep, and continues through mealtimes and all the day's activities. Music is one of the highest pleasures that can never leave the body behind entirely. For musicians, the mind-body connection is at the heart of making music. It's sheer physicality in the service of - at its best - something that nearly transcends the body. On the best nights, it's like soaring through a sky of sound. I imagine the ghosts wandering Augustine's namesake city can neither make nor enjoy music. Augustine never allowed himself to completely enjoy music, so out of tune he was with his own body. Like Augustine, I sometimes feel weighed down by the body and its needs. But the body is my music-maker (ah, Elmore James! ), my means to higher pleasures beyond the body. I think great music is best enjoyed when the body, mind, and soul are all brought into harmony. How do you get mind and body in tune with each other?